There were two recipients of the Nobel Peace Prize this year – the rather less known Kailish Satyarthi and near celebrity cherished Malala Yousafzai. In awarding the prize, the Norwegian Nobel Committee deftly ignored the perceived frontrunner, Pope Francis. Il Papa will have to wait his turn. Those getting it will always be marred by the contradictions any peace prize suggests. The greatest of all remains the fact that the dynamite guru – Alfred Nobel himself – did as much for the cause of war as he decided his profits would supposedly do for peace. Peace was a sentimental afterthought. Many winners of the prize have since kept this legacy alive: that of war maker turned peace maker; a fair share of hypocrisy, with a good share of feigned sincerity. Satyarthi doesn’t seem to suffer those problems. He made his name targeting the persistent use of child-labour in India. In the business of freeing slaves, it is hard not to admire efforts that saw the freeing of over 80,000 children from a state of servitude. What of, argues historian Sarah Waheed, the Malalas you do not see? They are very much the victims of a dysfunctional relationship between Pakistan and the United States, one that is all too brutally characterised by the continued use of drone strikes and bundles of US aid. “Unlike Malala Yousafzai… Madonna did not dedicate a song to them, nor has Angelina Jolie spoken out on their behalf.” They are the faceless ones, the sort that celebrities so conspicuously resist. Malala, on the other end, is ideological candy for the morally outraged in Hollywood and beyond. She did, after all, survive. Malala, in what is becoming something of a sanctification project, risks falling into the role of a moral cipher for a range of other causes in a global battle that is both political and cultural. She is a moral reminder, but also an alibi for actions taken under the cover of improvement. She has become a politicised Shirley Temple, a child politician of the developing world. Her life under Taliban rule – which she no longer experiences by virtue of her move to Britain – is becoming the cudgel to use, be it in her statements against the Taliban, or her general pronouncements on the BBC reflecting on those harrowing experiences under their rule. This is the tragedy of politics and morality – at a certain point, manipulation is unavoidable, be it through its own self-justifying propaganda, or basic sloganeering. The public relations watchers have quickly noted the “important binary” of selecting “a Pakistani Muslim” and “an Indian Hindu”. “Their joint selection,” argues Elias Groll in Foreign Policy, “is an obvious nod towards the ongoing efforts to bring a peaceful end to Pakistan and India’s long-standing conflict with one another”. 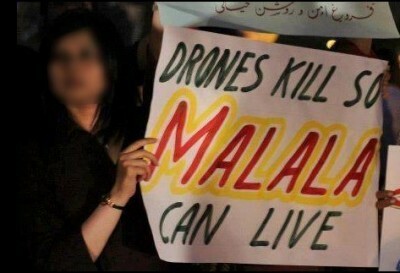 That maturity, however, is in an ever problematic dance with Malala the emblem – one that European and American voices can use in their cultural causes against other states even as villages get struck by the lethal work of drones. Sainthood and martyrdom tend to be poor tools for measuring actual change.